This object should be centered vertically inside the required area. Tables should not be used. 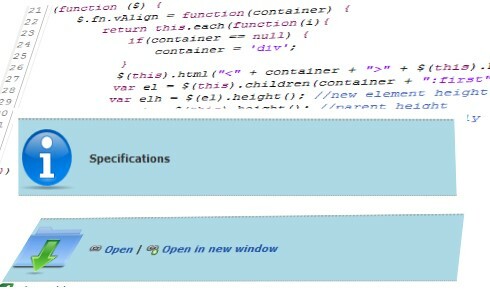 Though there is a CSS property vertical-align, it won’t work like attribute valign in HTML tables. CSS property vertical-align doesn’t seem to be able to solve this vertical alignment problem. There were ofcourse a couple of solutions using css. But all involves elements inside an element (For eg: <div>inside another <div> and style). But this may be difficult for bloggers, who want to show some content in special formatting (For eg: In my site, notes are shown in a special style). For eg: you want to give a 200px height to a <p> element and vertically center the elements (Same was the case with mine). Find the margin, and assign it to the new element using css margin-topproperty. Just call the function vAlign() with the required element. The contents inside will be automatically aligned vertically. You may optionally speciy the new element to be created. Useful, if you want to create a <p> element inside instead of a <div>. By default <div> elements will be created. $("div.info").vAlign("p"); //This will create &lt;p&gt; as the holder element. $("p.warn").vAlign("span"); //This will create a &lt;span&gt; element. $("p.warn").vAlign().css("color","red"); //Yes, you can chanin methods. <span>selements are inline elements, the block properties do not apply to them. So if you want to use inline elements like <span>, <a> then the display:block property should be applied.